NOTE: These special documents can be used to also restructure your existing LLC with these same great money-saving benefits. The operating agreement (OA) is the nuclear LLC document. It is the “heart & soul” of the LLC. The OA extraordinaire is the most powerful OA ever. (Most others are worthless!) 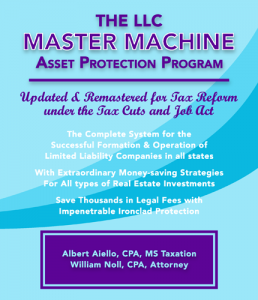 Adaptable in all 50 states (and DC), it is specifically designed for your real estate so that your LLC will give you optimum legal protection and maximum tax savings. 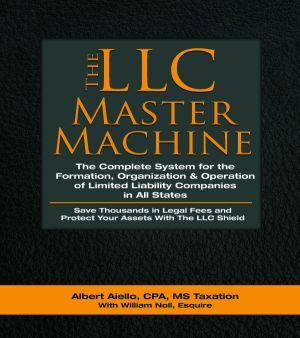 It’s 121 pages simultaneously gives you: An Impenetrable Legal Shield, Tax Savings, IRS Audit Defense, And More. Operating Agreement Extraordinaire (121 page Blank format w/table of contents to review) which blows everyone’s mind! (Blank format with instructions for completion). – One of the most vital of entity formalities to prevent piercing of the veil, all specially targeted for real estate operations; filled-in and ready to go. You can use these without physical in-person meetings. so you own nothing, yet control everything > STOPPING lawsuits before they ever begin! _A special OA Extraordinaire for the C-corporation as a minority member of the real estate LLC partnership with easy-to-follow instructions…where you can reap even more tax-saving deductions with no extra money going out, plus IRS audit proofing and asset protection. Great Features: Tables of contents for easy reference, larger print spacing, user-friendly to employ. As great as the former LLC Master Machine was, this one is even better! can be used to resurrect and restructure existing LLC’s. powerful vehicle of wealth protection that will save you substantially, year in and year out! We show you how to easily and privately do this without having to have to notify the state! is a superbly designed trust automatically transferring your estate assets to your family without probate or contest. It is also an intrepid asset protection trust giving you total privacy and protection, shielding all of your personal assets from lawsuits, public-exposure, divorce, and other eradicators of your wealth. Bank accounts, brokerage accounts, securities, annuities, life insurance, etc. Far superior than a revocable living trust, the PET’s 80 pages include all of the necessary legal provisions; estate transfer instructions; estate tax matters, with the shield of spendthrift protection from claimants. Included are two different trusts, one for married spouses; the second one for an unmarried person. As a well documented Grantor trust it has no adverse tax consequences whatsoever and no IRS or local tax return are necessary. Includes step-by-step instructions. money-saving system. You will NOT get it anywhere else. attorney, NOT from any other speakers! NO where but NO where! !